Proceedings of the Sixteenth Vertebrate Pest Conference, (VPC-1994) Published at the University of California, Davis, November 1998 ISSN: 0507-6773 360 pp. 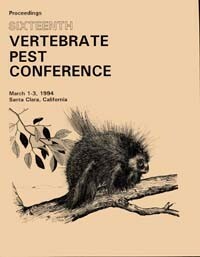 Description: Proceedings of the 16th Vertebrate Pest Conference March 1-3 1996 Rohnert Park, CA, arranged by the Vertebrate Pest Council of the Vertebrate Pest Conference Editors Wendy S. Halverson and A. Charles Crabb. Description: Bear Relocations to Avoid Bear/Sheep Conflicts, Unwanted Guests: Evicting Bats from Human Dwellings and Managing Raccoons, Skunks, and Opossums in Urban Settings.